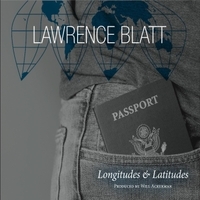 When I saw that Lawrence Blatt’s latest release Longitudes & Latitudes was produced by Will Ackerman it totally made sense. Ackerman is a great acoustic guitar player that I have enjoyed over the years particularly when he was running his Windham Hill label. Right from the outset of this album I could hear Ackerman’s influence however now he is more of an influence on the production side of the house. Tom Eaton is the engineer on the album as well, a consistent partner of Ackerman. As stated on his website Lawrence often plays in an open tuning to create a nice rhythm then adds the other instruments. It is a very effective combination. He plays electric and acoustic guitars and synthesizer (and like any good musician has many to choose from). Many of the guests appearing on the album help to make this journey complete including Ackerman and the marvelous brass of Jeff Oster. Because of the diversity offered on the album it is clearly an instrumental foray into new age, jazz and world. The percussive elements on the track “Ima” along with various earthy tones, switch the albums path to a worldlier flavor when prior tracks were bubbling over with a definite new age/jazz flavor and inspiration. The beauty of many of the recordings I have heard this year pay tribute to Mother Earth and that is the route Lawrence took as well on several tracks. With 15 tracks there is plenty to process and it’s a beautiful thing. “Upon Griffy Lake” carries a gorgeous melody with the equally attractive female vocals of Noah Wilding. The lady seems to call out to you from beyond as the music lets you float to your destination via the acoustic and electric guitar lines of Lawrence. He uses a intriguing and impactful combination of acoustic and electric instruments with the young lady’s voice serving as an instrument as well. It is one my favorite tracks. So much beauty and gracefulness packed into one song is hard for the mind, body and spirit to miss. The other component I recognized on this album is the excellent restraint exercised when needed to accentuate each instrument allowing for the best compliment to each. Each track moves from strength to strength. “Noches de Barcelona” is full of the embodiment that is Spain and the video with the track is beautiful. It was featured on our Rate The Tracks site and is provided here as well. We have also included a preview of the album with a video and a Soundcloud stream so you can get a good idea of what this talented artist can offer. This is 5-star recording session that is both relaxing and exciting at the same time, not an easy task to pull off. It is all done extremely well and the tastes of genres is most appealing including the mixture of them all in one single track. Add Longitudes & Latitudes to your list one of the very best instrumental recordings of 2016. It’s not hard to do if you appreciate new age, jazz or world or all three combined, the choice is obvious so give it a good listen!